My mate told me about The Feisty Jack British food truck, and I just had to check it out for a review. At lunchtime on Friday, I left the Brits in Toronto HQ, strolled two blocks south, a couple of blocks west, crossed the traffic lights, ran across a busy road … and there it was, like a red, white and blue beacon, at the corner of Simcoe Street and Wellington Street West (check where they’ll be on Food Trucks Toronto first). There were only about four people in the queue, so I didn’t have to wait long before ordering. 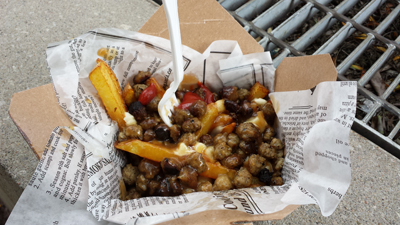 I went for the English sausage poutine, on Yukon Gold fries, Mozzarella cheese and onion gravy ($9). The portion size was definitely filling enough for lunch and came in one of those boxes that stops the grease from leaking out over your jeans. Nice touch! The food quality? Excellent! The sausage had a nice meaty tang to it, backed up nicely by the well-sized fries. The cheese melted perfectly over the top, all complemented by the rich onion gravy. It was the perfect, comforting lunch for a chilly, grey Toronto day. One small criticism: I checked the street food menu on their website and was excited to try the TFJ Chicken Tikka Box … but found out that they only choose certain items to sell from the truck on any one day. So you are limited to what is on the menu that day. I can live with that. It means I have an excuse to go back every Friday now to work my way through the menu! Overall, very nice and I give it the first Brits in Toronto 5/5 stars. Well done! 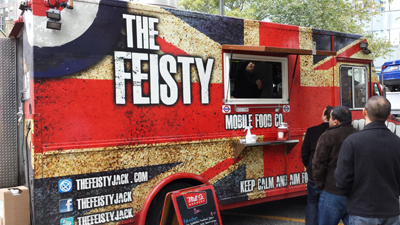 This entry was posted in Uncategorized and tagged british food truck, brits in toronto, the feisty jack on October 26, 2013 by britsintoronto.